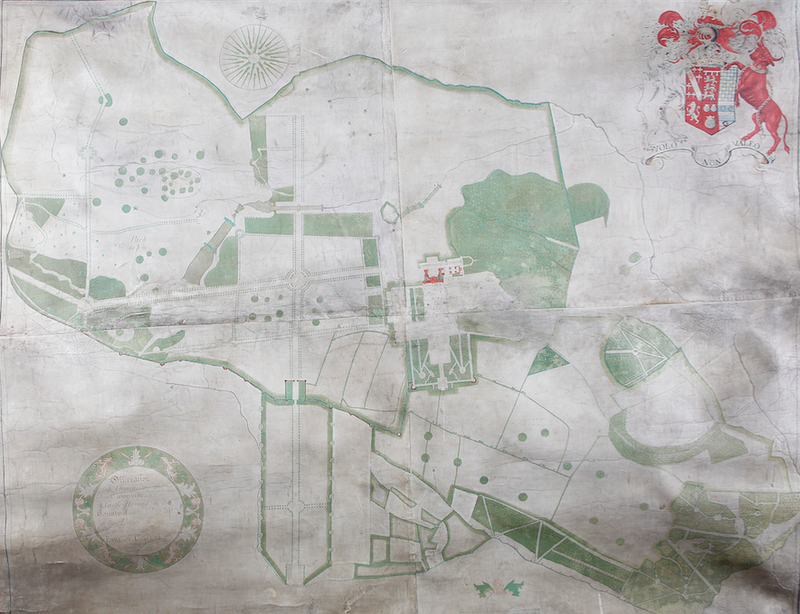 Our first piece of evidence is the Estate Survey of 1694 (Figure 1), presumably carried out on the instruction of the Third Earl of Carlisle so that he could evaluate the condition and potential of his estate. By reorientation it to true north, we are able to use the location of Sata Pond and Ray Wood to locate the boundary of the Arboretum with reasonable accuracy (Figure 2). The current boundary of the arboretum includes areas that were mostly deer park but also includes elements of tenant farms and part of Henderskelfe village. 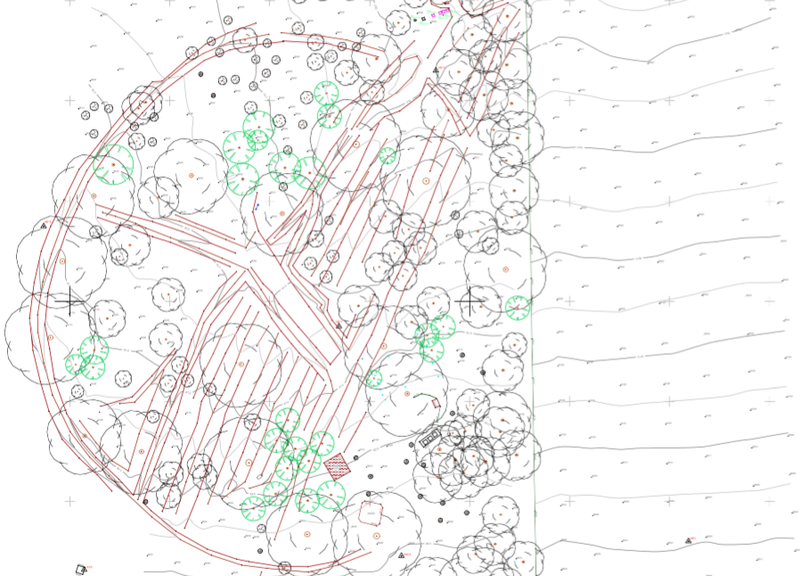 A curious feature of the survey is that one tree is circled (Figure 3), suggesting that this area was shut up, presumably for timber production. However, the plan shows clearly that this was one of the only such areas in the deer park. A topographic survey carried out in 2013 (Figure 4) clearly identifies a bank and ditch enclosing the area and a rectangular arrangement of ridges and furrows. The chronology of the use of this area is difficult to explain: what are the ridges and ditches and when were they created? If created before the tree planting, they may be traces of arable production (in which case they are highly sensitive) or if contemporaneous with the tree planting, they may be a form of drainage (the area is after all, very boggy). It is unknown whether these features predate the park pale and ditch running immediately to the north of parts of the bastion wall and there may well be other explanations, but at this stage, it is possible to speculate that there is an important example of landscape heritage in this area that fits with the wider processes of Acts of Enclosure, parkland creation and agricultural improvement that merits further research. When we turn our attention to Vanbrugh, perhaps the first thing to say here is that two features are worth noting in the secondary literature: firstly, that most historians writing about the history of the Castle Howard landscape do so from an art history perspective, rather than a social, economic or environmental perspective; and secondly, that the term landscape architecture is a relatively recent invention. In landscape history, this term is often used to describe ‘architecture that is situated in the landscape’ (as opposed to ‘agricultural architecture’ or ‘military architecture’) rather than the profession of landscape assessment or design. As such, great care needs to be taken when evaluating the secondary literature and there is a need for a landscape history to be written that looks at this period from the modern understanding of landscape architecture. The late seventeenth and early eighteenth century was a time of massive reforestation across England: John Evelyn’s Sylva was published in 1664, and the effect of this can be seen in many of Kip and Knyff’s illustrations, showing the extent and proximity of new woodlands to country houses, with tree-lined vistas leading out into the countryside, of which Castle Howard is one of the greatest examples. Interestingly, it was the First Earl of Essex, father-in-law of Charles Howard, who is credited with first conceiving of a woodland garden: perhaps it was not just Vanbrugh and the Third Earl of Carlisle who should be credited with the design of Ray Wood. 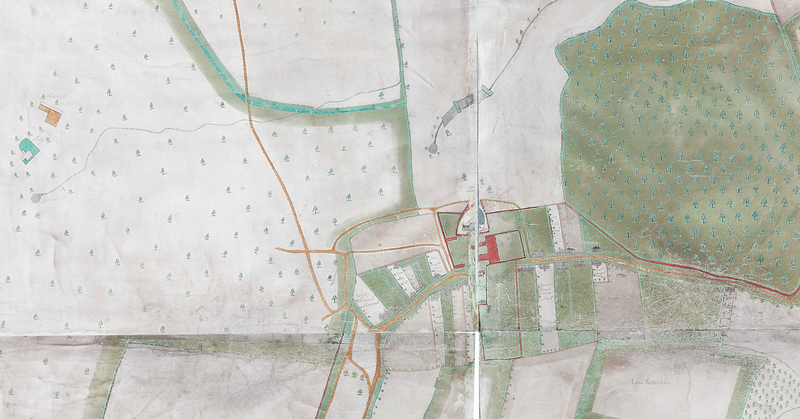 Today, Vanbrugh is more celebrated for his architectural work rather than his landscape or garden designs but when we look at the scale and detail of his plans in the 1727 Estate Survey (Figure 5), we can see that there is a strong argument for re-evaluating this position as well. His designs are today striking and defining features of the Howardian Hills, and many of the finer details can still be read in the arboretum: the lime avenue originally extended to a glade where Cedar Vista is now, and the composition of the woodlands that were planted here were extremely sophisticated for the time, including a diverse combination of hornbeam, Robinia and more usual woodland trees. The track, the bastions and the Bastion Wall are today visible relics of this work. 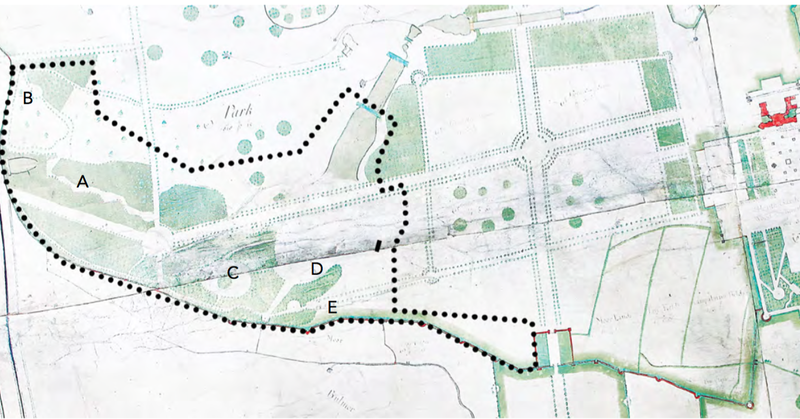 A close look at the 1727 Estate Survey (Figure 6) shows that the area now occupied by the arboretum includes a number of interesting features: a serpentine walk through the woodland (A) (a feature that is usually only described as occurring in Ray Wood), a number of glades (B and C) within the woodland, a framed vista (D) on an alignment that Russell Vista now occupies and a secondary entrance to the woodland (E) that was later re-imagined by James Russell in 1981 as the main entrance to the arboretum. When contemporary designers think about landscape narratives we tend to value the ‘open,’ personal and multivalent over those that are didactic and ‘closed.’ The 1727 landscape of Castle Howard certainly falls into the latter camp but perhaps this layering of history shows how accumulations of interventions by designers and managers can enrich and open even the most explicit: although the key features of the wider landscape design are well known but this brief review shows that there is a great deal yet to be discovered.